I love using mnemonic devices in my classroom. Many of my students struggle with poetry. 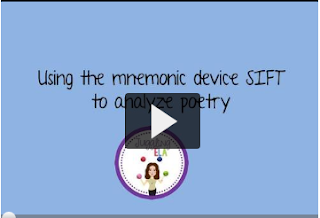 The SIFT method can be used for any poem. Watch this FREE video and use the accompanying PowerPoint Lesson (fully editable) in your classroom. The video is 2 minutes and 21 seconds and the PowerPoint is 7 slides. **This is the first video in a series that will come out over the next few months. Please check back for more videos.